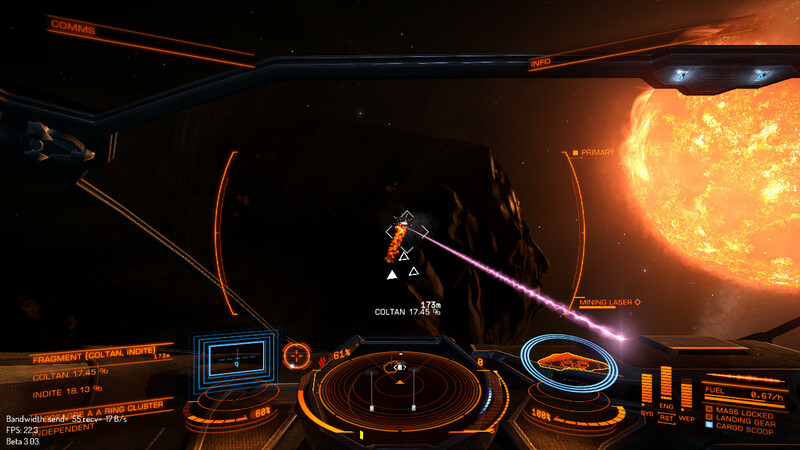 Mining asteroids was added to Elite Dangerous in Beta 3 and allows the player to recover raw materials from various asteroids found in systems. Asteroids in the “core” systems are generally mined-out with no more resources left, but asteroids in other systems that are further out still have lots of resources left. You can use the system view in the galaxy map to see the level of resources left in an asteroid belt to see if it is worth visiting. 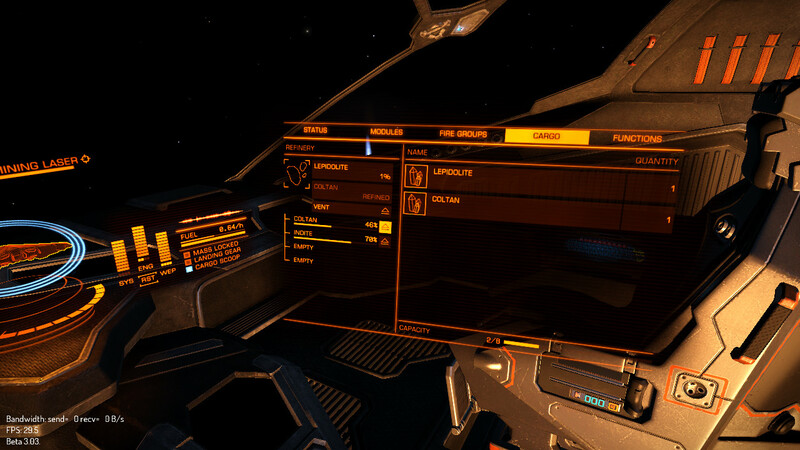 Mining in Elite Dangerous requires two key pieces of equipment - a mining laser, and a refinery. The mining laser is used to break pieces of material off of asteroids. The refinery is used to convert the pieces of material into pure units of each commodity. Select your asteroid belt that you want to mine by using the System View to find a belt that is showing as “Major Reserves”. Different belts have different commodity types. In the system with the belt you want to mine, select the asteroid cluster to mine using the navigation panel and super cruise there. When you arrive at the asteroid cluster, approach an asteroid. You will need to get quite close. When you are close enough, select the firing group that contains the mining laser and fire. If you are close enough you will see that the mining laser has impacted the surface of the asteroid leaving a scar. An example of this is shown in Figure 1 (if you are not seeing the impact of the laser, you're probably not close enough). Go and scoop up the fragments as they are ejected. Take care when scooping very near to a rotating asteroid as you may collide with it if not careful. The fragments appear to slow-down and stop when they get about 250m away from the asteroid, so it may be better to wait for them to do that before chasing after them very close to the asteroid. Each of these fragments will contain a mixture of commodities (for example figure 1 shows the fragment is 17.45% coltan and 18.13% indite) that will need to be processed by your refinery. When you have scooped up a fragment, you need to select which commodity or commodities you want to refine otherwise you will get a warning over the scoop target computer. Different class refineries have different numbers of hoppers - figure 2 shows a unit with 4 hoppers meaning that you can refine 4 commodities at once. Keep collecting more and more fragments until to fill up each hopper to 100%. When you reach 100% you will gain a complete unit of the commodity. If you want to stop refining a particular commodity (for example if you find a more valuable one) then you can click on the “eject” icon to abandon it. Once you have filled your cargo containers you can go and sell your goods for pure profit!